This post contains affiliate links. NurtureShock by Bronson and Merryman has a chapter discussing how to jump-start language skills. We often console ourselves and each other with “Don’t worry, he will talk when he is ready.” It is true that children have their own time tables, but it is also true that studies have shown there are things you can do to help and hurt language development. “Sometimes a kid who seems to catch up wasn’t actually behind in the first place; their receptive vocabulary was proceeding apace, but they weren’t talking much because they were shy or didn’t quite have the motor control yet” (page 224). So yes, there are children who seem to be behind and then just explode. There are things that we can do as parents to help enhance language acquisition and things we can do to harm it. The following are taken from NurtureShock. Do speak face to face with your baby. “Studies have repeatedly shown that seeing a person’s face makes a huge difference. Babies learn to decipher speech partly by lip-reading” (page 203). 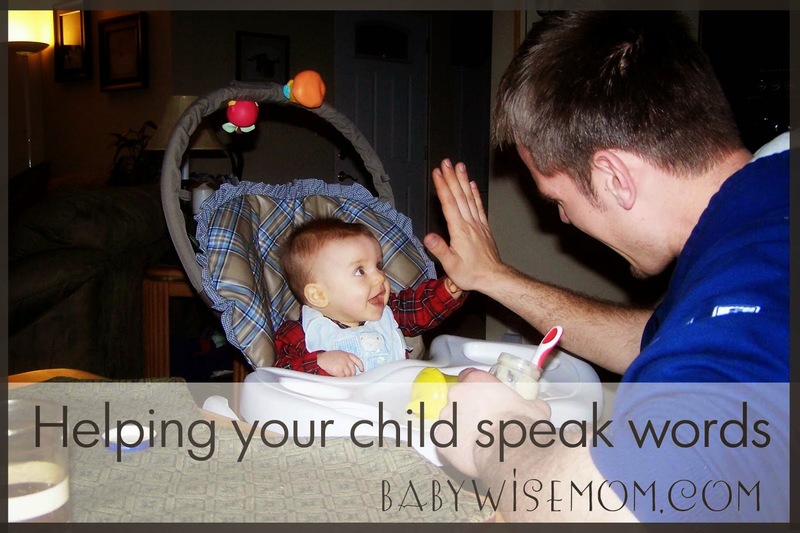 Watching a person speak helps a baby learn where words stop and new words begin. Studies have shown that children of mothers who respond to them within 5 seconds are six months ahead in language development of those whose mothers take longer than 5 seconds. The most important thing is not you starting conversations, it is how you respond to what your child is saying to you (page 208). When your child is showing interest in something, describe it. Touch it. “This variable, how a parent responds to a child’s vocalizations–right in the moment–seems to be the most powerful mechanism pulling a child from babble to fluent speech” (page 209). Do physically pat, touch, or kiss your child when she is vocal. Do this in response to her babbles. Studies show this increases the “frequency and maturity of the babble” (page 214). Do object label. This means you tell your child what an object is. Ideally, you do this when the child is looking at the object. You follow the baby’s interest. Do move objects while labeling them if your child is younger than 15 months old. This helps make the labeling a multisensory experience. See page 217 for more. Do get more people involved. Researchers have found that children do not learn words if they hear it from only one person. They need to hear it from multiple people. They distinguish pitch and speed. “By hearing what was different, they learned what was the same” (page 217). Do rephrase your sentences. Say the same thing in different ways. It helps children to identify what each word in a sentence really means and refers to. Do label shapes. I found this very interesting even though it is only briefly explained. Children have a world full of objects that are really the same when it comes to labeling, and yet they look different. Labeling shapes helps them be able to draw connections between objects. Do not watch DVDs made for making babies “smarter.” I think it is widely known and understood at this point in time that these DVDs do not make your child smarter. It not only doesn’t help, but it actually hurts. “…the more children watched, the worse their vocabulary” (page 201). And yes, this is referring only to the shows like Baby Einstein and Brainy Baby. Do not “overdo” the “Do’s” above. “Children need breaks for their brain to consolidate what it’s learned” (page 214). It is even stated that “Sometimes children just need play time, alone, where they can babble to themselves” (page 214). Independent playtime! Do not pretend your child is saying words when she isn’t. Putting words in your child’s mouth or applying meaning incorrectly to what your child is trying to say actually confuses the child. We all think our children are brilliant, but sometimes babble is just babble. And babble is an important part of learning to speak, so don’t dismiss it. I really must add my own “Do,” and that is to read to your children. Read daily. Reading helps you provide a more varied vocabulary than what you naturally use in your day to day life. I am actually surprised that reading with a baby wasn’t addressed at all in this chapter. Add that in.